What will happen to the solar system in the future? Just as the Solar System relies on the Sun as its source of energy, so too is its fate linked to that of the Sun. The Sun is right now a middle-aged star. It has existed for about 5 billion years, and will go on shining, pretty much unchanged, for about another 5 billion more. At that time, it will go through major changes that will bring an end to the Solar System as we know it. To understand these changes, we must first understand where the Sun's energy comes from. Like all stars, the Sun is made mostly of hydrogen. This is the simplest of all atoms. Because the Sun is so large and its gravity is so strong, the hydrogen atoms near the center of the Sun - at its core - are under extreme pressure, and are squeezed very close together. Sometimes, four of these atoms are squeezed so tightly together that they collide with enough force to stick together permanently, forming a new, larger, and more complex atom: helium. This process is called nuclear fusion, and when it happens, an enormous amount of energy is released in the form of heat and light. Nuclear fusion is what powers the Sun, and hydrogen is the fuel that it burns. Eventually, the Sun will burn all of the hydrogen in its core, and the fusion will stop. Once this happens, the core will shrink under its own gravity, until it becomes so dense that the helium atoms will begin to collide to form carbon (from three helium atoms) and oxygen (from four helium atoms). These collisions produce much more energy than the hydrogen fusion that powers the Sun today. The extra energy will cause big changes in the Sun. The core will become much hotter, causing the Sun to swell to over one hundred times its present size, swallowing up the planets Mercury and Venus. Even though the core will be hotter, the surface will be cooler than it is today, changing in color from yellow to red. A star at this stage is called a red giant. What about here on Earth? When the Sun expands, the Earth will not be spared. Like Mercury and Venus, Earth will probably be absorbed by the expanding Sun. But even if it is not, it will be no place to live. The oceans will boil, and the atmosphere will be blown away. What is left will be a barren, sun-baked rock, unable to sustain life. Meanwhile, the helium-burning reaction in the Sun will produce solar wind much stronger than it is today. 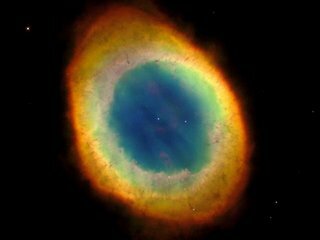 As it leaves the Sun's surface, it will carry with it some of the hydrogen in its outermost layers, forming a planetary nebula. As more matter is carried away from the Sun, the solar wind will continue to strengthen. Eventually, it will blow away so much of the Sun's matter that there will no longer be enough pressure at the core to keep the helium fusion going. At that point, what's left of the Sun will contract under its own gravity, becoming a much smaller, very dense star called a white dwarf. The white dwarf will radiate off heat that is left over from the earlier nuclear fusion, but it will no longer generate any new energy. After a few billion years, even this energy will dissipate, leaving behind a cold, dark stellar corpse. But will this really be the end? As bleak as this future might sound, there is a silver lining. All of that matter blown away from the Solar System during will eventually be compressed again by gravity, along with the remains of other long-gone stars, into a cloud of gas and dust much like the one that gave birth to our Solar System. In this cloud, many new stars will form with planets of their own, and just possibly, some of these planets may one day produce living beings who will look at the sky and wonder: where did we come from?